Subscribe to get deals from hundreds of merchants including the best of Atrium Restaurant, Holiday Inn Singapore Atrium! Valid till 31 Dec 2019. Present NTUC Card to enjoy the promotion. Not valid with any other discounts, promotions, privileges, coupons or vouchers or any other special events at the discretion of the Hotel Management. All promotions are strictly valid for dine-in only. Not valid on Valentine’s Day, Mother’s Day, Father’s Day, Christmas Eve, Christmas Day, New Year’s Eve, New Year’s Day, Eve of and the 15 days of Lunar New Year and for any take away offer. Discounts are not valid on any take away offers including all take away from the regular menus, Christmas Festive Season Take Aways, Chinese New Year Goodies and Mooncakes. The management reserves the right to amend the terms and conditions without prior notice. For reservation, call +65 67317172 or email atriumrestaurant.sinhi@ihg.com. Please always check with the merchant on the validity of the promotion before purchase. Valid from 1 January to 31 December 2019. Not valid with any other discounts, promotions, privileges, coupons or vouchers or any other special events at the discretion of the Hotel Management. All promotions are strictly valid for dine-in only. Discounts are not valid on any take away offers including all take away from the regular menus, Christmas Festive Season Take Away, Chinese New Year Goodies and Mooncakes. Maybank TREATS General Terms and Conditions apply (PDF). Please always check with the merchant on the validity of the promotion before purchase. The Offers are not valid on eve of Public Holidays, Public Holidays, blackout dates and special occasions determined by the hotel. The Offers are not valid in conjunction with other promotions, privileges and vouchers. Payment must be made with a HSBC credit card. This Promotion is valid from 1 March 2019 to 31 December 2019. Please quote "HSBC Dining Privileges" prior to ordering. HSBC is not the supplier of and accepts no liability for the goods and services provided by the Merchant involved in this Promotion. The Merchant and HSBC reserve the right to vary any of these terms and conditions, or to withdraw this Promotion, at any time in their discretion without prior notice. All information is accurate as at time of publishing or posting online.. Please always check with the merchant on the validity of the promotion before purchase. The Offers are not valid on eve of Public Holidays, Public Holidays, blackout dates and special occasions determined by the hotel. The Offers are not valid in conjunction with other promotions, privileges and vouchers. Payment must be made with a HSBC credit card. This Promotion is valid from 1 March 2019 to 31 December 2019. Please quote "HSBC Dining Privileges" prior to ordering. HSBC is not the supplier of and accepts no liability for the goods and services provided by the Merchant involved in this Promotion. The Merchant and HSBC reserve the right to vary any of these terms and conditions, or to withdraw this Promotion, at any time in their discretion without prior notice. All information is accurate as at time of publishing or posting online. For a party of two (2) or more, the varying savings are only applicable when a minimum order of two (2) buffets are ordered. In the event that two (2) buffets are not ordered, a 15% savings will apply. Savings are not applicable to promotional menus or à la carte menu.. Blackout dates apply: Eve of Public Holidays, Public Holidays, Special occasions (Mother's Day, Father's Day and Valentine's Day). Please refer to https://icm.aexp-static.com/Internet/IntlHomepage/pdf/Love_Dining_Restaurants_TnC.pdf for the full terms and conditions. . . ". . Please always check with the merchant on the validity of the promotion before purchase. Valid from 1 April to 30 June 2017. One-day advance reservation required.. Offer is limited to one redemption per card, per table, per bill. No splitting of table/bill is allowed.. Offer is valid for dine-in only and is not applicable for takeaways. Offer is not valid in conjunction with other offers, discounts, privileges, promotions, sets or vouchers.. Offer is not valid on eve of and on Public Holidays and special occasions (e.g. Father’s Day).. Other terms and conditions apply.. Please always check with the merchant on the validity of the promotion before purchase. Formerly known as the Melting Pot Café, the newly refurbished Atrium Restaurant offers an extravagant spread of scrumptious cuisines. Headed by Executive Chef Chua Yew Hock, a culinary expert specializing in creating local Singaporean dishes with a modern twist, partnered with IHG® Culinary Ambassador, Ian Kittichai, a connoisseur in authentic Thai cuisines, Atrium Restaurant lavishes its diners with epicurean food and pampers them with a theatrical show offered by the restaurant’s live kitchen stations. This all-day dining restaurant’s new contemporary vibe and monochromatic interior accented with orange and greens will not only satisfy taste buds but also please other senses in a multisensory dining experience. Offering an appetizing carte du jour for buffet and ala carte spread, diners are guaranteed to be satisfied with the carefully crafted dishes conceptualized by Atrium’s Executive Chef. 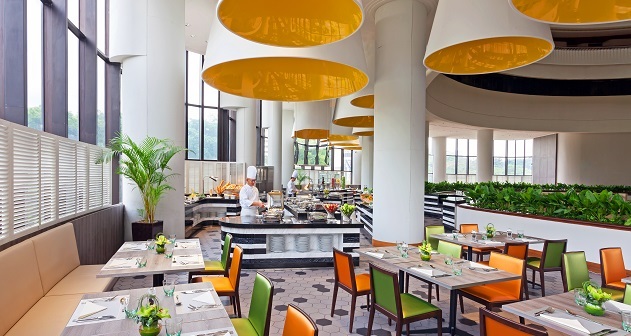 Atrium Restaurant’s buffet spread include fresh seafood, high-quality sashimi and sushi and other delectable international cuisines such as Provencal Lamb Rack, Roasted Lamb leg with Mint sauce, Fish Piccata, and savory Risotto among many others. Other highlights would include Executive Chef Chua’s signature dishes. He’s highly acclaimed Assam Fish prepared with just the right balance of heat, tart and sweetness of the fish’s tender meat is a definite must try. Chef Chua’s take on Singapore’s well-loved Chilli Crab, an iconic Singaporean cuisine served with deep-fried mantou, is another dish diner’s shouldn’t miss. Another best seller is the Curry Laksa, a signature dish created with fresh shrimps, fish cakes, boiled egg and savory milky gravy. The Mussel Otah-Otah is another sublime creation made to satisfy cravings for delicious authentic Singaporean cuisines. Celebrity Chef, Ian Kittaichi’s Kai Tod Hat Yai or Marinated Tumeric Chicken is another ovation-worthy dish offered at Atrium Restaurant. Aside from these, other delectable authentic Thai cuisines worthy of mention are Chef Ian’s Tom Yum Soup and Seared Beef Sirloin Salad. Attrium Restaurant also offers yummy desserts such as decadent chocolate cakes, gelatos, crepe and waffles and an extensive selection of beer and wine for the ala carte menu. Dining at Atrium Restaurant just got a whole load better with their promos and deals. Diners can now feast for the price of one with Atrium’s 1-for-1 promotional. Those celebrating their natal day can also avail of Atrium’s Ultimate Birthday Celebration Package that features use of the main event area, free flow of soft drinks, themed balloon banquet, 50 pieces of assorted helium balloons, complementary use of one registration table, LCD projector and screen and one wireless microphone. Aside from these deals, kids aged 12 and below can dine for free and access Atrium Restaurant’s special kids menu, a selection of healthy, nutritious and scrumptious cuisines created in partnership with Nutrition Australia. Guests looking for top-notch Singaporean dishes and Thai cuisines and other delectable menu should visit Atrium Restaurant at Holiday Inn, 317 Outram Road, Singapore 169075. The place is highly accessible and is only a 10-minute walk from the Outram MRT station. Atrium is open for 24 hours from Mondays to Sundays. For reservations, call +65 6731 7172 or email hiatrium@ihg.com.